The latest operating system of Microsoft’s windows 7 is considered as the best ever Operating System which allows high quality graphics, new designs, animations, and many other features. However many people like windows XP operating service more, and don’t want to change into windows 7 for their own reasons. There is an option Windows transformation pack to change their operating system. There is a major advantage of windows7 operating system, which is its super bar. However by using the ViGlance tool, you can change your normal bar to look like Windows 7 Super Bar, without having to change the entire operating system. ViGlance is a freeware that changes your normal default bar to super bar. 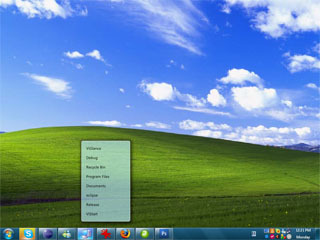 Windows7 bar is featured with latest style to provide various background effects. All opened programs will be adjusted in super bar easily instead of creating group of opened items. This tool changes entire functions and looks of normal bar to super bar instantly. You just need to download it on your computer and launch it. The rest will be handed automatically by this application. It will also enhance the performance of windows XP to give better result to the users. Even your start button will be organized systematically.